"41UR315, outside of burial, Vessel 228" by Timothy K. Perttula and Robert Z. Selden Jr.
DECORATION (INCLUDING MOTIF AND ELEMENTS WHEN APPARENT): The rim is decorated with alternating sets of diagonal incised lines pitched in opposite directions as well as six sets of triangles filled with two rows of tool punctations. There also are two rows of punctations on the rim, one at the top of the rim and the other at the rim-body juncture. The vessel body has six incised panels that are defined by vertical incised lines. Inside the panels is a central vertical row of tool punctations that are connected to diagonal incised lines pitched in opposite directions. 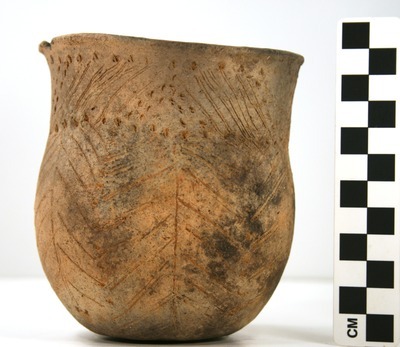 Pease Brushed-Incised jar, Vessel 228, outside of a burial.